National Instruments has made eight promotions to the position of vice president, across three departments. Francis Griffiths, Victor Mieres and Owen Golden have been promoted to VP of sales for Europe, Asia Pacific and the Americas respectively. John Hands is now VP of product marketing, data acquisition and industrial control, while Kevin Schutz is VP of R&D, data acquisition and distributed I/O. In addition, Tony Vento is VP of applications engineering, Jon Bellin is VP of R&D, application and system software, and Arleene Porterfield is VP of global information technology. Radiant Imaging has promoted Douglas Kreysar to the new position of chief operating officer. Previously, he had been VP of operations since 2001. In the new role, Kreysar will be responsible for internal operations including manufacturing, quality, legal, finance, engineering and human resources. 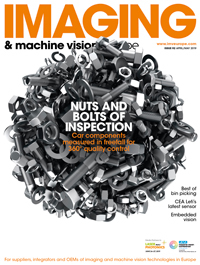 Toshiba Imaging Systems has appointed Ian Tobi as marketing support engineer, whose primary responsibility will be to support the industrial imaging product line.